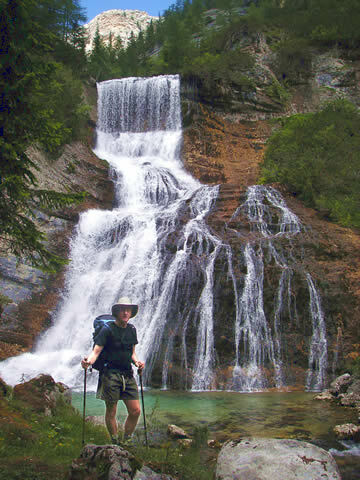 This is a trip that I part-designed for two friends who wanted an introduction to hut-to-hut walking and a bit of luxury as well. They loved it! 06:45 Manchester T1 Jet2 flight LS801 arr. Venice 10:15. Summer bus timetable not yet available. Winter timetable shows 11:15, 15:15, 18:15, journey time 2 hours. Sun 3 Jul Bus (or taxi) E towards Passo Tre Croci/Misurina, get off at Rio Gere (about 15 minutes). Take two ski lifts to Rifugio Lorenzi (2932m), view, lunch, explore the start of the Sentiero Ivano Dibona. Return the same way. A short, easy day. In the afternoon, could walk down to the road on path 203, possibly 206 (etc) instead of taking the second lift. Mon 4 Jul Bus (or taxi) N towards Dobbiaco, get off at Podestagno or the approach road to Malga Ra Stua (about 15 minutes) (1449m). Walk W on path 10 to Rifugio Lavarella (2042m). Gentle walking on a jeep track. Rifugio Lavarella +39 0474 501079 or the nearby Rifugio Fanes +39 0474 501097 There's an interesting variant to the start of the walk: stay N of R Fanes until you get to Cascata de Fanes, climb S down then up the gorge, a little mild scrambling, and behind a waterfall. Alternatively turn N from the original path (sign: Via Ferrata?) and just go to the waterfall and return. Cable car down to the road and bus to Cortina. Walk via paths 401, 402, 404, 403 to Rifugio Dibona (2637m, lunch) then paths 403, 405, 410, 411 to Col Drusié (1779m) then cable car down to Cortina (1011m). Walk SE via paths 401, 402, 440 (other routes possible) to Rifugio Scoiattoli (2225m, lunch) then paths 439, 437, 434 to Lago de Federa (2046m). There's an interesting wartime tunnel down from beside the lift station towards the road. Take gloves, hat, and torch: follow the GALLERIA signs. 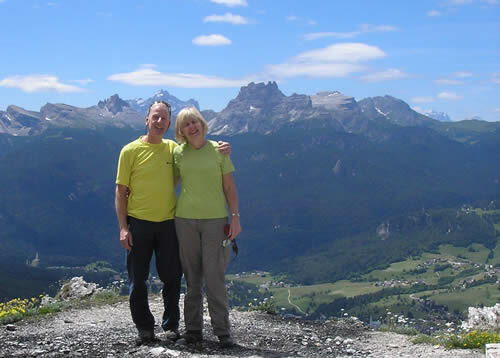 Thu 7 Jul From the rifugio walk NNE via paths 431, 430, 438 to Cortina (1011m). Quiet paths mainly through woods. Cortina Or bus 15:15 to Venice arr. 18:15. 18:00 flight LS802 arr. Manchester 19:30.